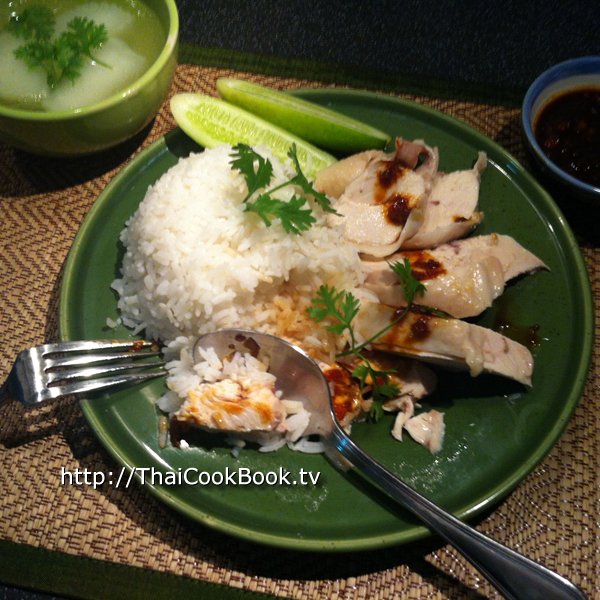 Khao Man Gai is the Thai version of a Hainanese Chicken and Rice. It is quite popular in Thailand, but not often served at Thai restaurants in the west. 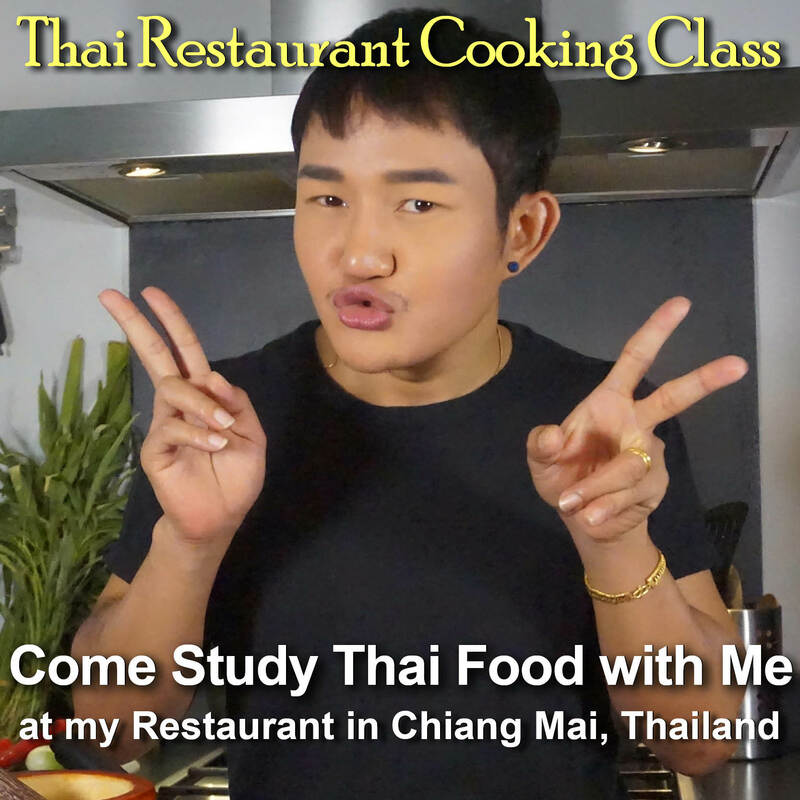 The dish consists of lightly seasoned boiled chicken, served at room temperature, along with hot steamed white rice that has been cooked in water with a little rendered chicken fat and other seasonings. A rich and earthy sauce made with fresh ginger, hot chilies, garlic, soy sauce, fermented yellow soy bean paste, and other seasonings, is served on the side. The dish usually includes a bowl of chicken broth, or a soup made with chicken broth and either Chinese winter gourd, daikon, or chayote. Fresh vegetables such as cucumbers, green beans, or cabbage may also be served on the side. We know it sounds a little boring, but the unique sauce is what makes this into a delicious meal. 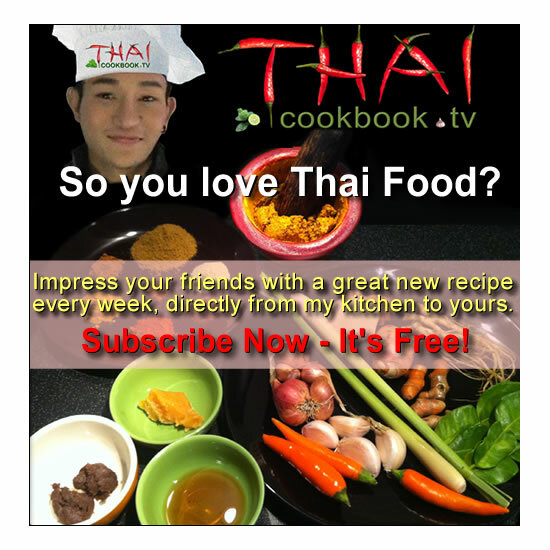 Watch Khun Worawut's video demonstration of the complete process from start to finish, including making his own very nice tasting sauce. What's in our Thai Chicken and Rice. How we make our Thai Chicken and Rice. 1) Boil the chicken in a large pot with salted water for about 45 minutes. 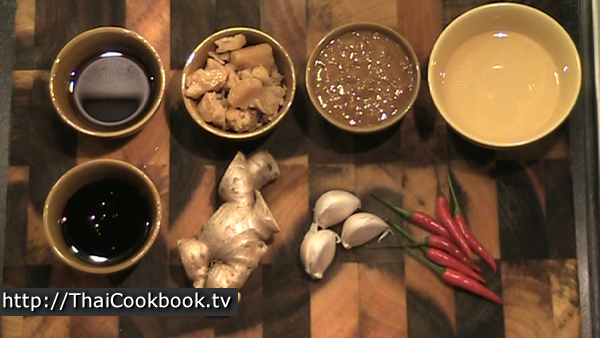 2) Prepare the sauce by grinding the ginger, garlic and chilies into a smooth paste. Add vinegar, both kinds of soy sauce, the soybean paste, coconut sugar, and the ginger paste you made to a small pan. Cook for about 1 minute. 3) Cook the rice with water, 1/4 cup of chicken fat, some garlic, and coriander root. 4) Remove the chicken from the pot and let it cool. 5) Prepare a soup using the chicken stock, Daikon, ground white pepper and coriander roots. Cook for about 10 minutes. 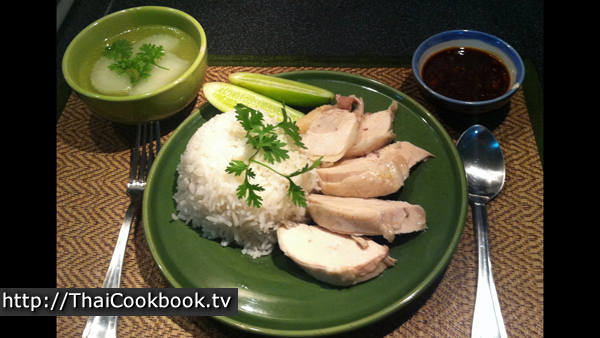 6) Serve cold sliced chicken with the hot seasoned rice, with a cup of soup and the sauce on the side. Select a nice fat whole frying or roasting chicken. This one is about 4 pounds. Place it in a big pot, and fill with enough water so the chicken floats freely. 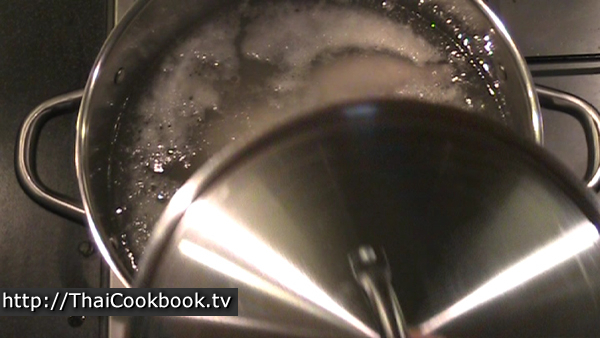 Add 1 Tablespoon of salt and heat over a high flame until the water starts to boil. Reduce the heat so it simmers slowly. Cover the pot with a lid and cook for about 45 minutes. Clean a 3 - 4 inch piece of ginger and cut it into small pieces, enough to make about 1/3 cup of ginger. Peel 3 - 4 large cloves of garlic. Remove the stems from 6 - 8 Thai hot chilies. Measure light soy sauce, dark sweet soy sauce, yellow soybean paste, coconut sugar, and vinegar, and have them ready. Using a mortar and pestle, grind the ginger, garlic and chilies into a smooth paste. You can use a food processor if you want, but mashing them together gets the juices blended well, so we do it the old fashioned way. The paste should look something like this when you are done. 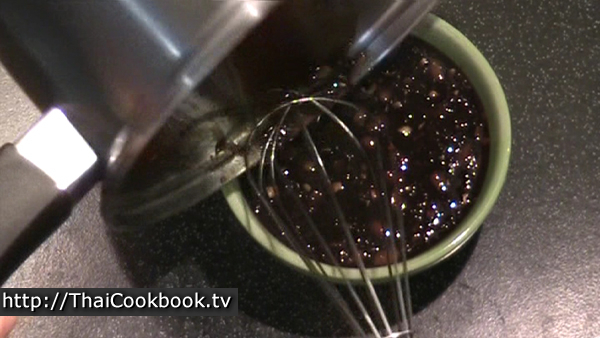 Add vinegar, both kinds of soy sauce, the soybean paste, coconut sugar, and the ginger paste you made to a small pan. Heat until boiling very hard, then reduce the heat and cook for about 1 minute, stirring constantly. After cooking, you will have a nice thick sauce. Let it cool down, then transfer it to a bowl. Check the chicken after about 30 minutes cooking time. You don't want it to be overcooked. The meat should be very firm, not falling off the bone as you might do if you are making chicken soup. When the legs move freely, it's probably done enough. You can pierce the fatty part of the leg, and if you see blood just cook it a little more. 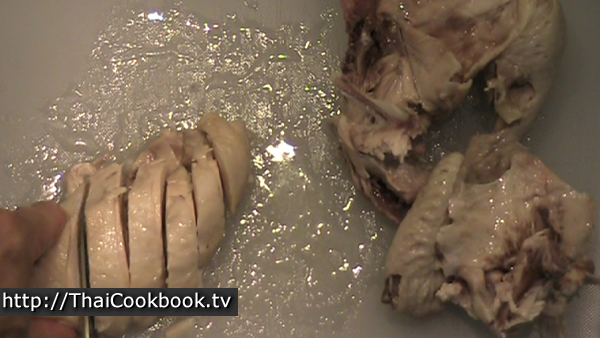 When it's done, remove it from the hot water and place the whole bird in a large bowl filled with ice water. This will stop the cooking right away so the meat stays firm and juicy. When the chicken is completely cold, remove the breast portions from the bone and slice into nice thick pieces. Use a large spoon or measuring cup to scoop off the fat from your pot of chicken stock. Mix it with water to get enough liquid to cook your rice. I got about 1/4 cup of fat, so I'm adding about 3 1/2 cups of water to get the 3 3/4 cups of liquid I need to cook my 2 cups of dry rice. Use the ratio of liquid to rice as on your package instructions. Add 2 slightly broken cloves of garlic, 2 bruised coriander roots, and 1 teaspoon of salt to the rice pot, then cook the rice. 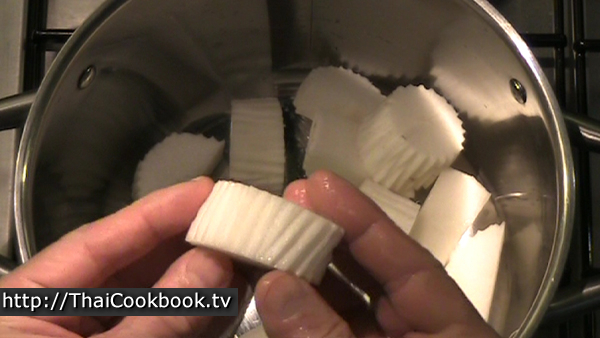 Wash and peel one large Daikon radish. You can also use Chinese winter gourd, chayote, or other similar vegetable if Daikon is not available. I prefer the flavor of Daikon. Cut it into 2 inch pieces and add to a medium sized pot. Add some of the chicken stock, enough so the Daikon is floating easily, then add 1/2 teaspoon of ground white pepper and 2 bruised coriander roots. Bring to a hard boil. Reduce the heat and simmer for 5 - 10 minutes. 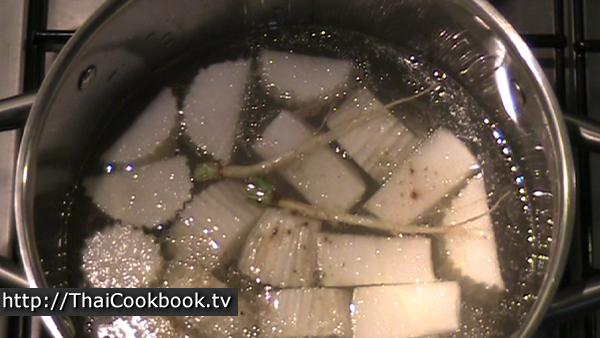 Start checking the Daikon after about 5 or 6 minutes. When it can be barely pieces with a fork , it is done. It should be very firm. You don't want to overcook it. Ladle the soup and 2 or 3 pieces of Daikon into a small bowl for each person. Serve the cold chicken next to a good sized portion of hot rice on a small plate for each person. Serve with raw cucumber, cabbage, green beans, or other crispy vegetable, a bowl of the Daikon soup, and a small dish of the sauce. Garnish with coriander leaves.